Gambling addiction was long categorised as an “impulse control” disorder that urges players to continue playing, despite the negative and damaging impact that this activity has on their lives. However, studies have found that players with a gambling problem exhibit more similarities with the behaviour of those suffering from substance abuse. This has led to the reclassification of problem gambling as an addiction disorder rather than an impulse disorder. Unlike substance abuse, the signs of gambling addiction are less visible, which makes them that much harder to address. There are several early signs of problem gambling that can help players and family members to identify this disorder more easily. In its own, gambling for extended periods may not constitute an addiction, unless there are certain aspects that are associated with it. One such aspect is repeatedly spending large sums of money, beyond one’s means, to experience the rush of gambling. Another sign that compulsive gamblers may exhibit is a feeling of restlessness and irritability when cutting down on gambling time. Gambling addicts will prioritise gambling over everyone and everything else, losing relationships, jobs and their personal worth. Problem gamblers will often lie about their gambling habits, may play in secret, and, even after repeated losses, rationalise their continued gambling arguing that they are due to win eventually. Players who have made repeated efforts to control their gambling habit either by refraining from playing, or by cutting down the time dedicated to playing, and failed to achieve these goals, may also have a gambling problem. Engaging in risky and illegal behaviour to feed their addiction is also a tell-tale sign of addiction. 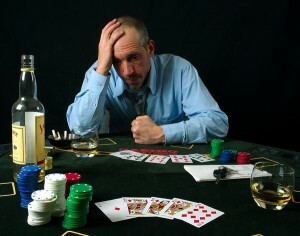 Gambling addicts often face financial bankruptcy as a result of their activity. If the above-mentioned elements persist over longer periods, professional help is in order. In the same way as alcohol addicts or those suffering from substance abuse have to resort to professional treatment, compulsive gamblers need to seek out professional help, which may include following a step-based programme similar to that used for treating alcohol addiction. Enrolling in a support group or going to a therapist are all viable options for those who need to address their compulsive gambling issues. Of course, as with any addiction problem, the first step is admitting the problem to oneself, and recognising the need for professional intervention in treating this condition. The promotion and observance of the principles of responsible gambling are highly encouraged, and in certain countries is even a compulsory requirement for online casinos. In the spirit of responsible gambling, casinos will usually have a section dedicated to problem gambling, where players can use a self-assessment tool to analyse their playing habits, and are encouraged to use mechanisms that are specially devised to prevent problem gambling. For example, players can set a betting limit or a deposit limit, or they can use the self-exclusion feature to prevent themselves from playing for a certain period. In the U.K., this feature is actually mandatory for all casinos operating under UK gambling law. Read more on gamblers’ anonymous Australia edition!